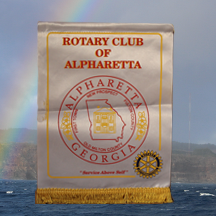 We are a club of more than 30 great members who are committed to serving the community and having fun! We do a wide variety of service projects throughout the year. 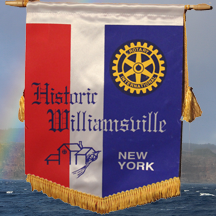 We also raise funds to award scholarships and provide grants to other community non-profits. In addition to the projects highlighted here on our home page, please also have a look at our About Us page for an overview and a video of our activities. 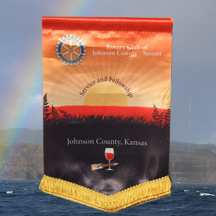 If you are interested in joining our club, we want to hear from you (Contact Us). 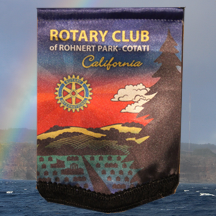 Or if you are a current Rotarian, please join us at a meeting or on a project! 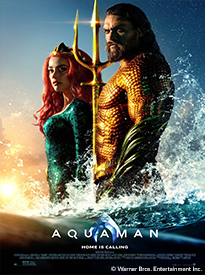 2019 Free Friday Night Movies in the Park! The concession stand will be staffed by Koloa Elementary School teachers and parents to raise funds for school activities. Bring a beach chair and a blanket. Come and enjoy the fresh air and free movie. 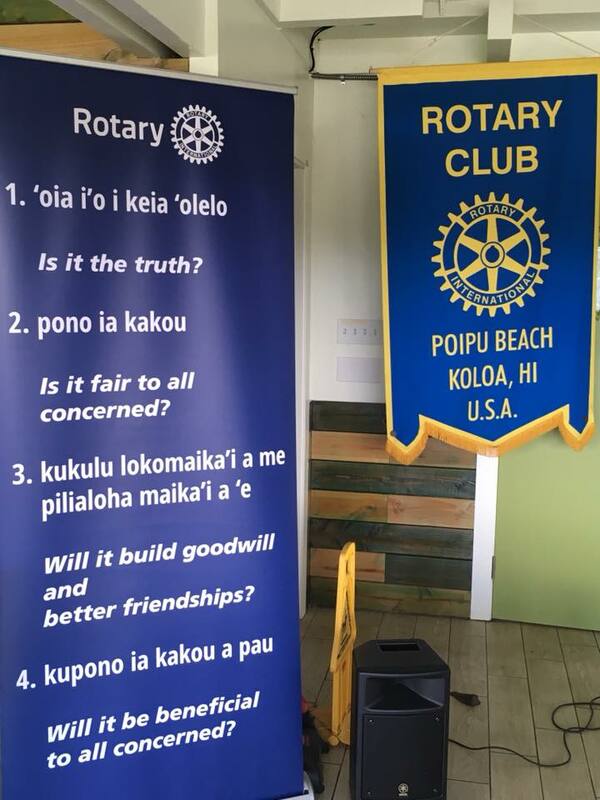 For eleven years, the Rotary Club of Poipu Beach has provided free family entertainment at Poipu Beach Park. 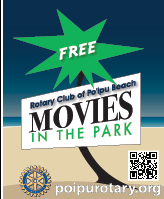 The Rotary Club of Poipu Beach idea is to bring the community together by showing family friendly films in the safe relaxed setting of Poipu Beach park. We start each movie with a performance by dance troupes or musicians. 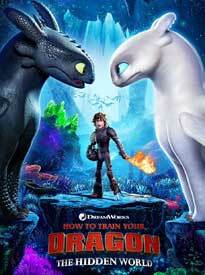 This event also supports the Koloa Elementary School PTSA as they offer a food concession at the movie. This has enabled them to fund many extracurricular programs that improve the quality of campus life for all of their students by funding after school activities and supplemental education programs that do not make it into the school budgets. 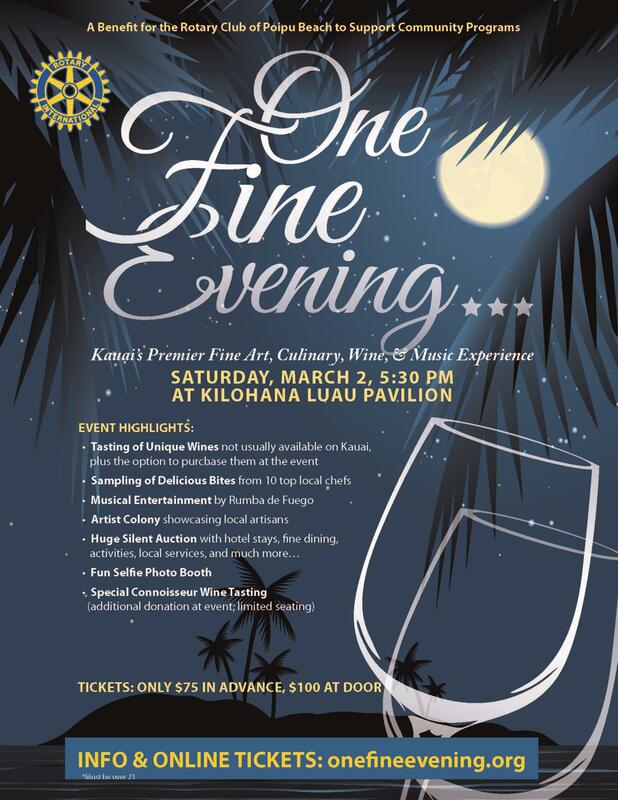 Join us for One Fine Evening on Saturday, March 2, 5:30pm at Kilohana Luau Pavilion! One Fine Evening is our club's annual event where we have fun while raising funds to support important community activities such as community service projects, scholarships, and community grants to non-profits. Tickets are only $75 in advance, $100 at the door! Get your tickets today for this premier event for adults ages 21 and over! 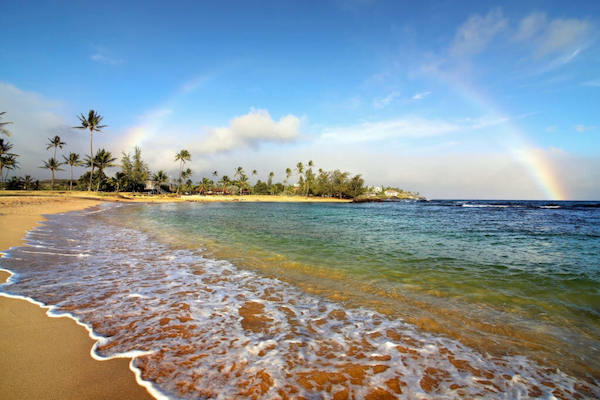 A significant portion of our fundraising goes toward scholarships on Kauai. The club recently awarded scholarships to these three outstanding culinary students at Kauai Community College. 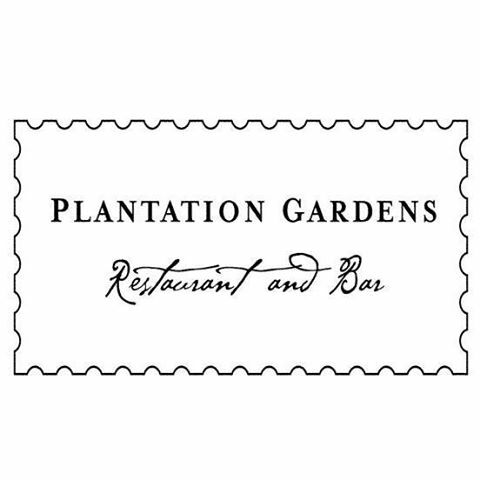 We look forward to eating their delicious food in local restaurants in the future! Paul St. John of California! Check back with us in Fall 2019 for a new drawing! It's time for our annual Vacation for Donation fundraiser, and it's better than ever! 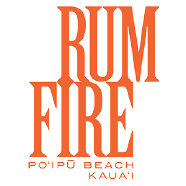 This year's grand prize include 7 nights at the Grand Hyatt, airfare from the U.S. or Canada, a mid-sized rental car, and $600 in dining certificates for RumFire Poipu Beach, Plantation Gardens, and other fine restarants (or take an alternate $3000 cash prize). 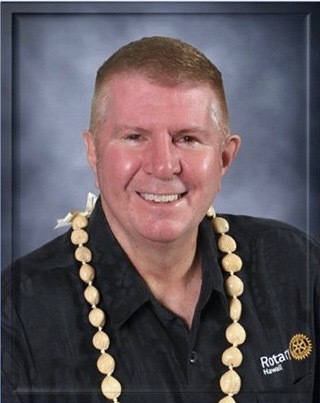 Just make a suggested donation of $30 or more to the Rotary Club of Poipu Beach Community Foundation, our 501(c)(3) charity and we will gift you with one or more drawing tickets. A maximum of 2000 tickets will be issued. Details can be found and online donations can be made at vacationfordonation.org. Drawing will be held on December 12. 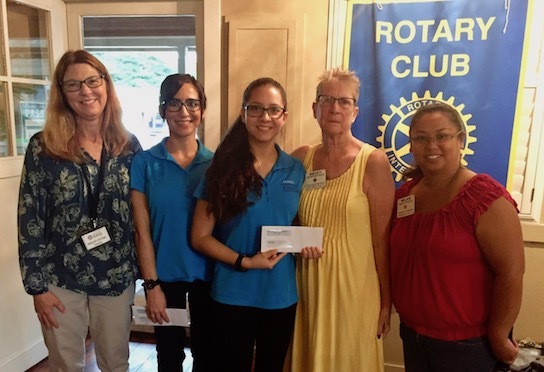 We recognized and celebrated the Kauai recipients of Hawaii Rotary Youth Foundation scholarships at an Island-wide luncheon with their parents. These bright and talented students were awarded $5000 scholarships to study at a 4-year college. Our club sponsored Haven Luper-Jasso. She plans to study Film Production and Marketing at Chapman University in California. Excitement was in the air as all four young women will be moving to the mainland in a couple of weeks and starting this next chapter of their lives. A hui hou! 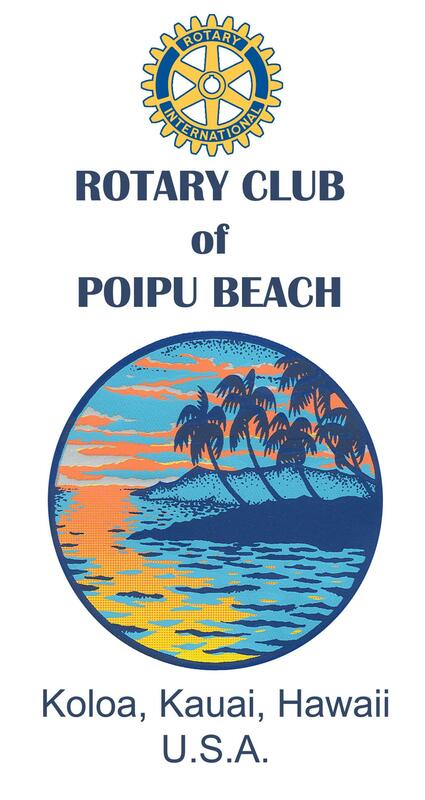 The Rotary Club of Poipu Beach is awarding $15,000 in community grants to nonprofit organizations on Kauai. The funds come from part of the proceeds of our One Fine Evening fundraiser held in March. The grant awards are used for items such as uniforms, food for the needy, transportation, safety gear, cultural education, sporting equipment and literacy supplies. 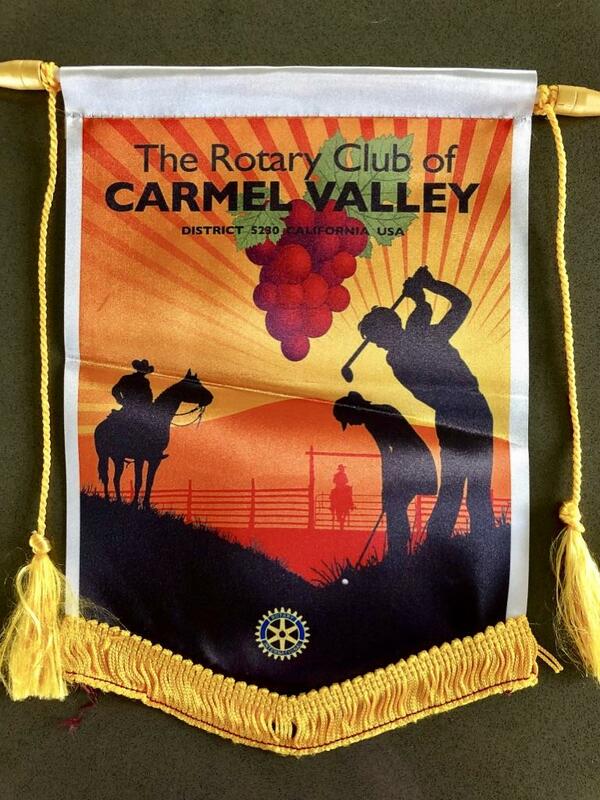 Each grantee organization must be sponsored by a Rotarian and then is invited to apply for the grant awards. 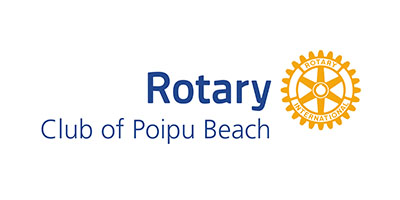 Nancy Kanna, Rotary Club of Poipu Beach past president and community grants chair, said since the Community Grant Program was established in 2001, the club has awarded over $275,000 to over 50 organizations. 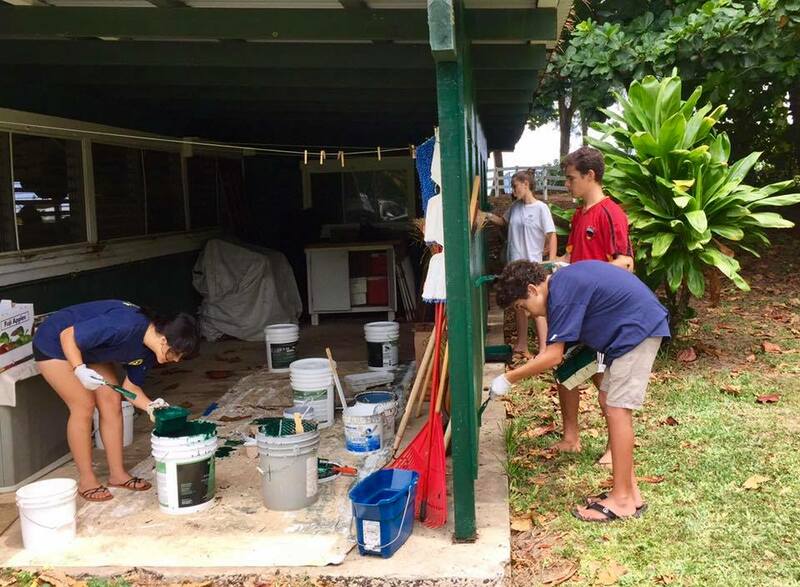 “By partnering and funding specific items for other nonprofits, we are able to work together to have an even greater impact in the Kauai community,” Kanna said. On April 15, 2018, there was catastrophic flash flooding in various locations on the island of Kauai. 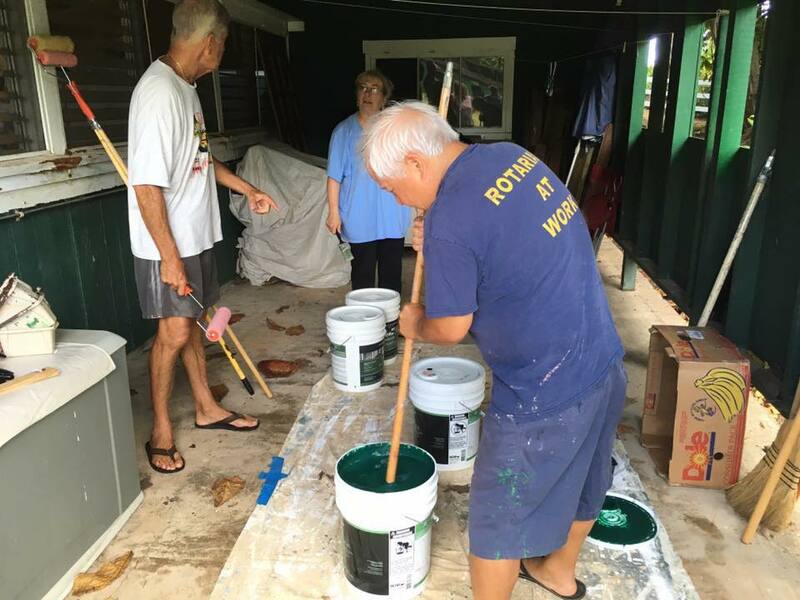 The worst damage was on the North and East shores, but 20-25 homes were flooded in Koloa, our Rotary home town. 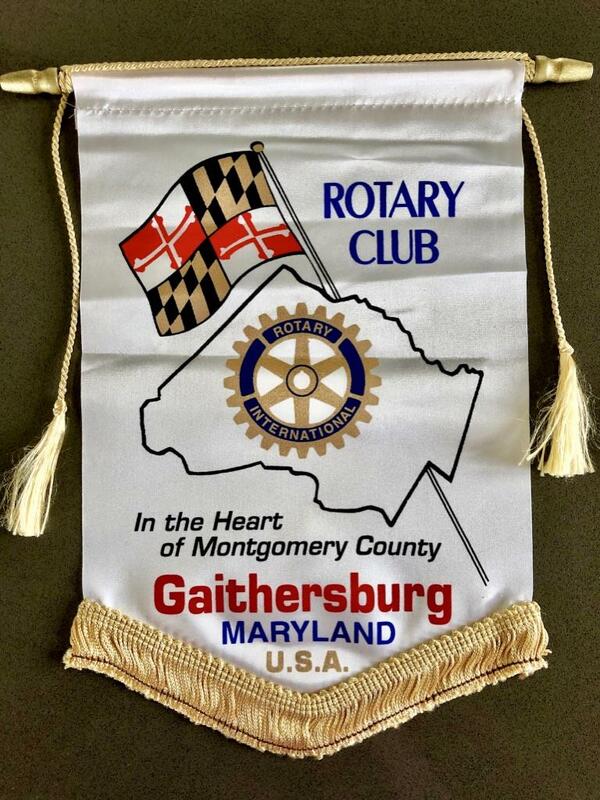 Rotarians volunteered to help families with cleanup the next weekend. 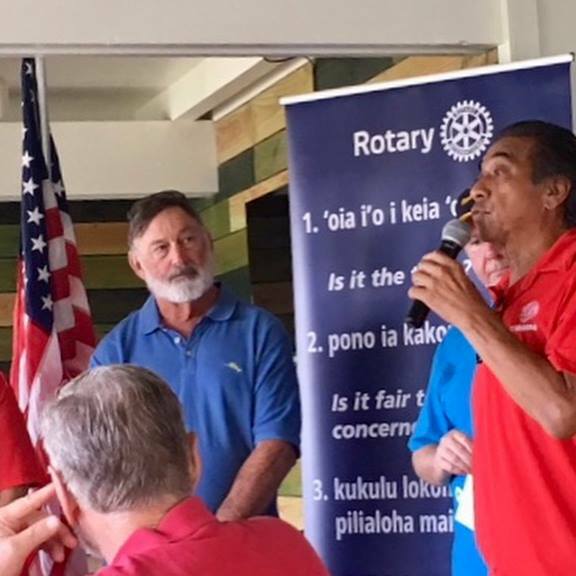 We are also ramping up our Rotary fundraising efforts to support these Koloa families and all the Kauai families who have been impacted as they go down the long road to recovery. Please click the Donate button at the top of the page to make an online donation. 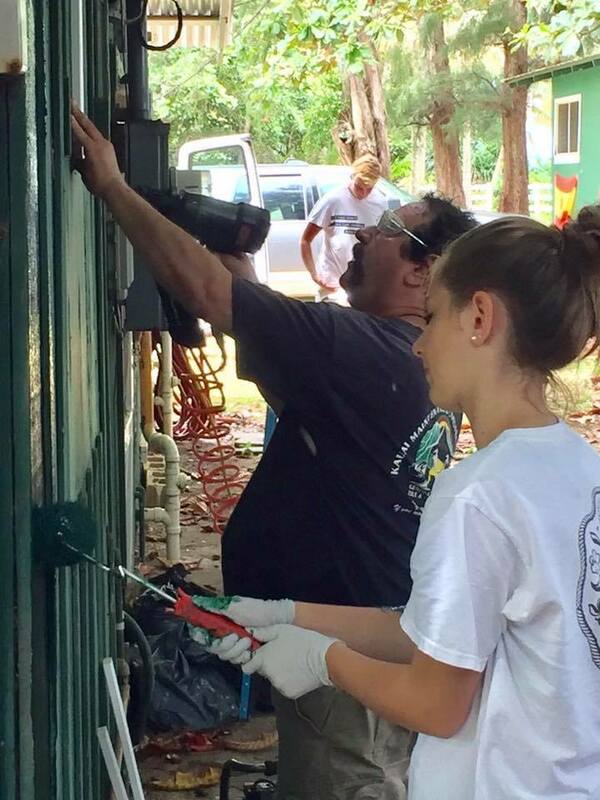 This year we added scholarships for Kauai Community College students in skilled trades programs. Scholarships were awarded at a special luncheon at the college where the food was prepared and served by students in the culinary program. It was fine dining at its best! Here they are pictured with the teachers who nominated them, along with President Milani Pimental and Club Administration Director Becky Fries. Thanks to everyone who worked hard to put on our One Fine Evening fundraiser at Kilohana Luau Pavilion. And thanks to all who came out to support us and enjoy fine art, food, wine, and music. It was a whole evening of fun and proceeds go to fund our scholarships, service projects, and grants throughout the year. Special thanks also to our silent auction donors and to our event sponsors: Earthworks Pacific, Wilcox Health, Amerigas, Kauai Coffee, Brennecke's, and Dupont Pioneer. 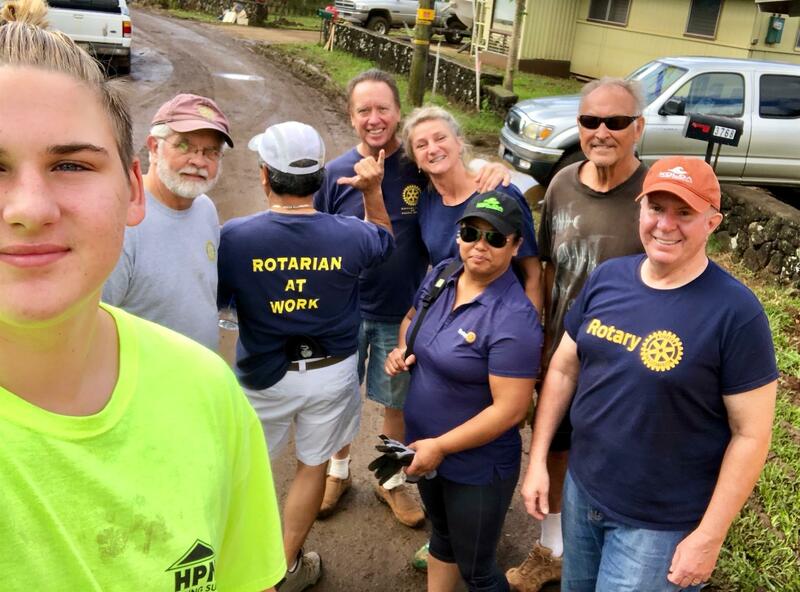 Volunteers from our club and the Island School Interact club cleaned up the highway in the Kalaheo area. 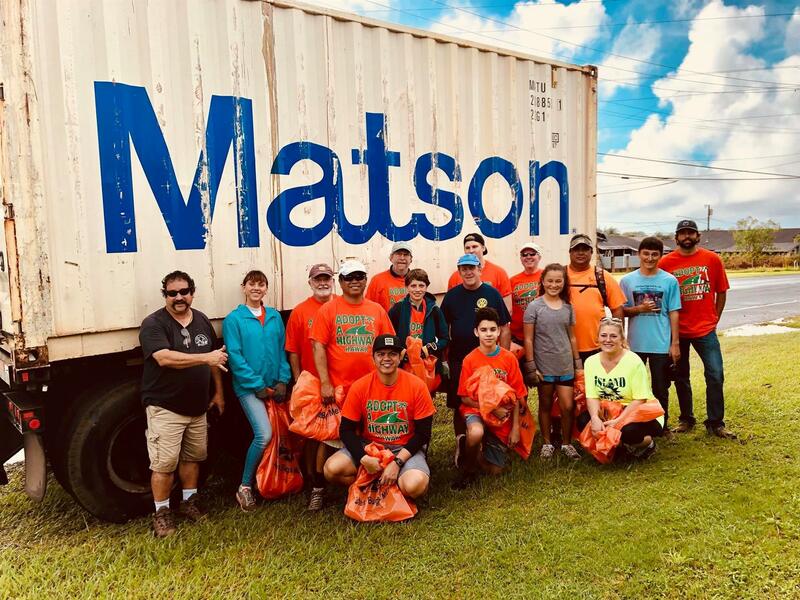 Thanks to Matson for their support of this project! Ho! Ho! Ho! About 100 children from Child & Family Services, in conjunction with Nana's House, were treated to breakfast, a movie, and gifts from Santa at Waimea Theater. This annual event is sponsored by our club. The Interact Club helped in advance to wrap Santa's gifts. 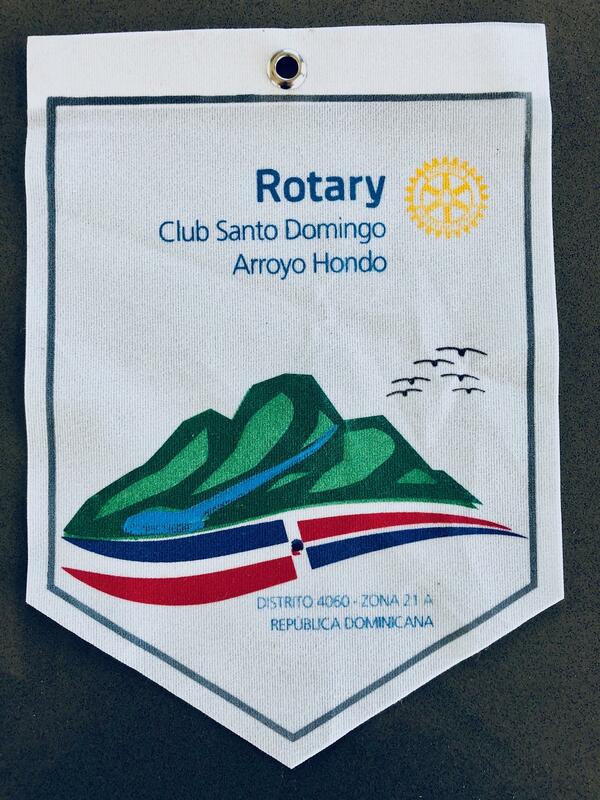 Each year our club sponsors inbound and outbound Rotary Exchange Students. Pictured above with President Milani is our inbound student, Finn Haake, from Germany. He is attending Kauai High School. Our outbound, student, Sydney Cervantes, is spending the year in France. 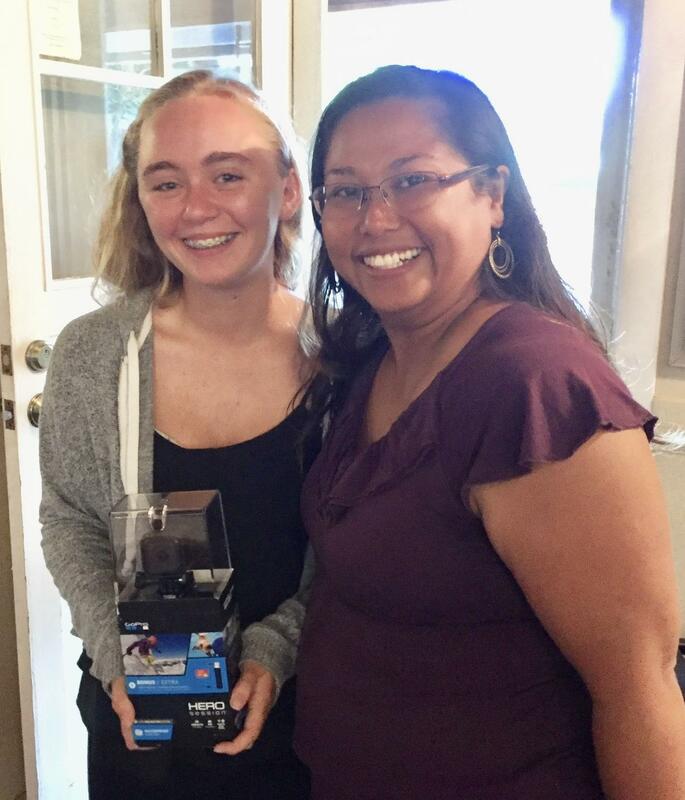 Each year the club awards Frances Dillon Memorial Nursing scholarships to selected students at Kauai Community College. This year's recipients are Jolene Lima and Brittney Barreira. Pictured above, left to right, are KCC Advisor Shelley Sutter, Jolene Lima, Brittney Barreira, Club Administration Director Becky Fries, and President Milani Pimental. 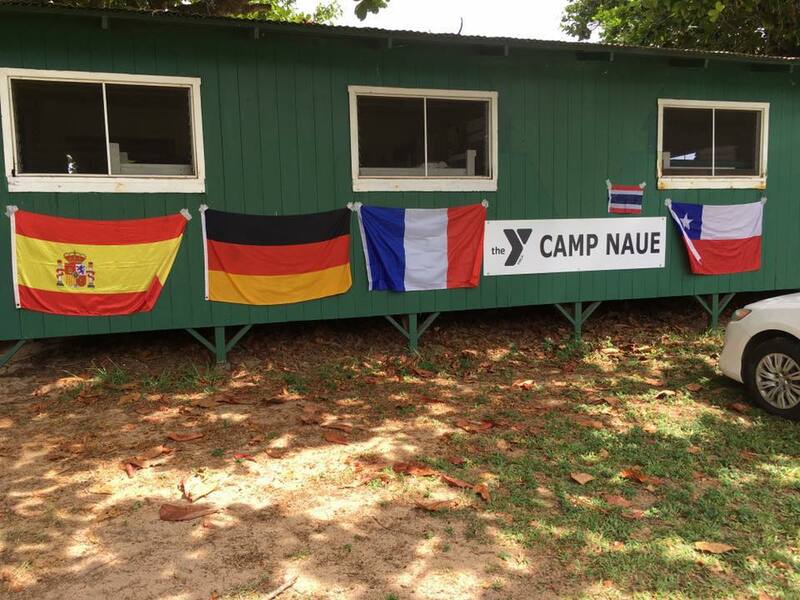 It was a great weekend at YMCA Camp Naue. 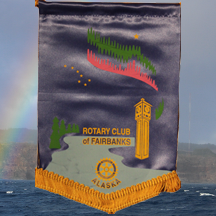 For many years the club has worked on repairs, carpentry, and painting, while also having fun. 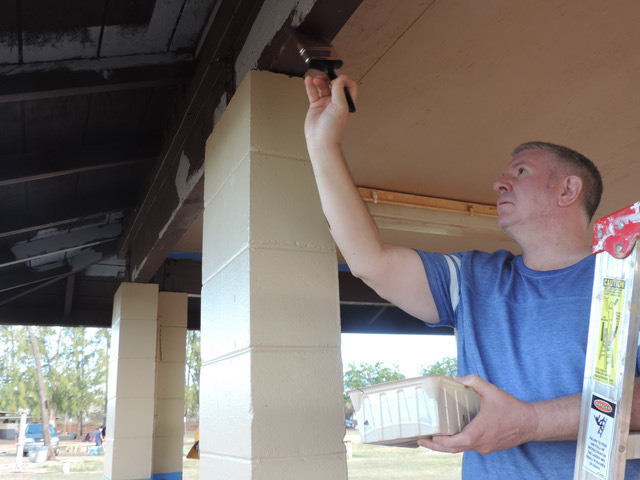 This year, with our assistance, all of the buildings and part of the pavilion were painted. We were aided by all five of Hawaii's Rotary Youth Exchange students. Four of them on our Kauai, and they were joined by the fifth from the Big Island. 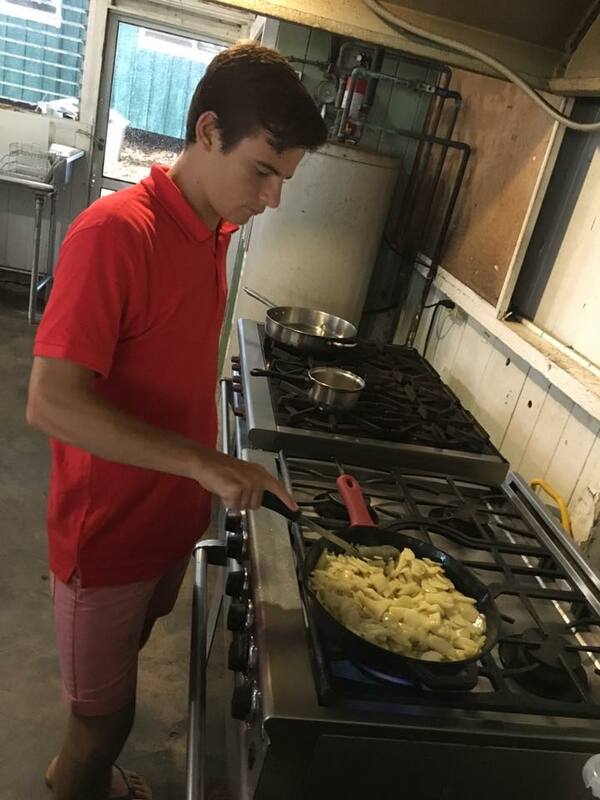 The exchange students also prepared a wonderful dinner featuring favorite dishes from their home countries. 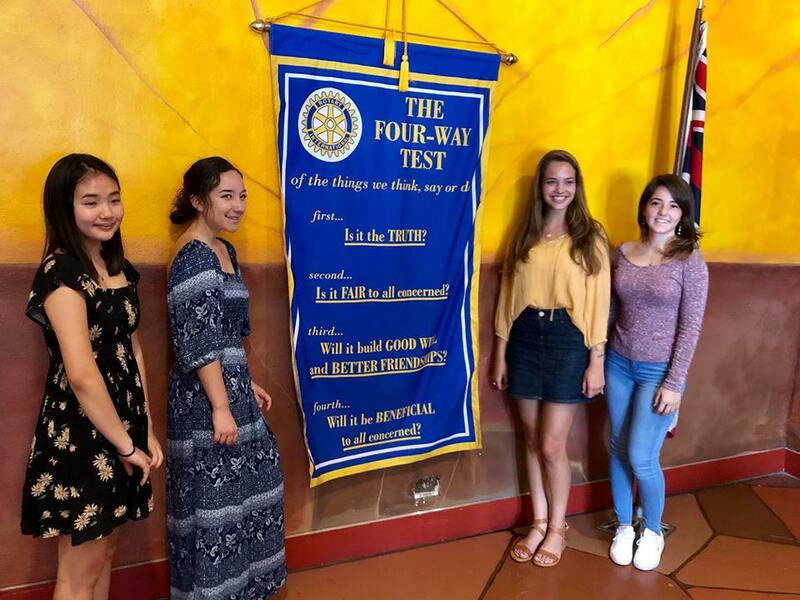 Kauai middle school students were invited to submit essays about using the Rotary 4-Way Test as a framework for decision-making. Jessica Hreljac was this year's winner. Her essay on using the 4-Way Test as a roadmap for life was very impressive. Jessica is a student at Chiefess Kamakahelei Middle School. 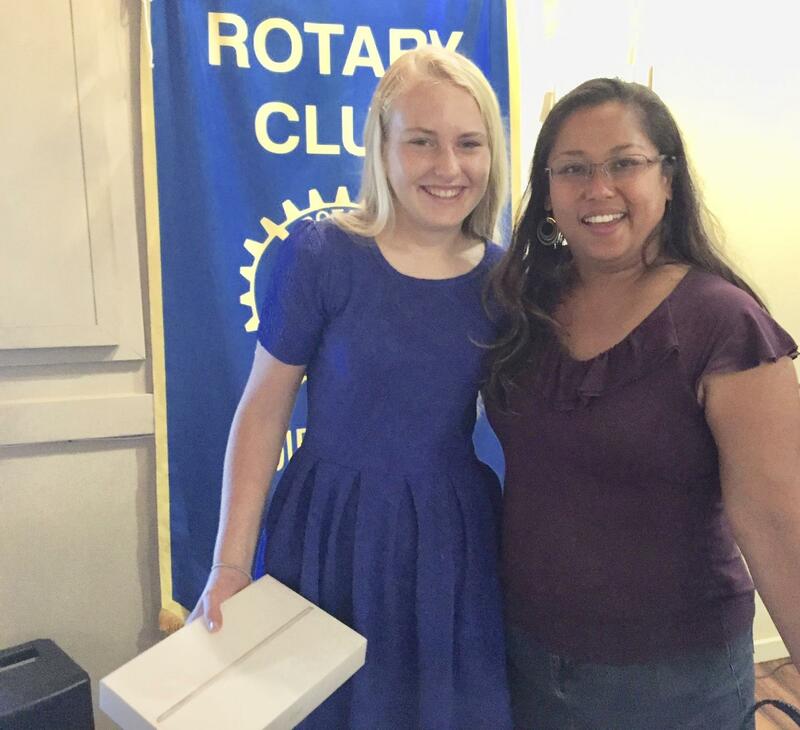 After reading her inspirational piece at a club meeting she was awarded an iPad! 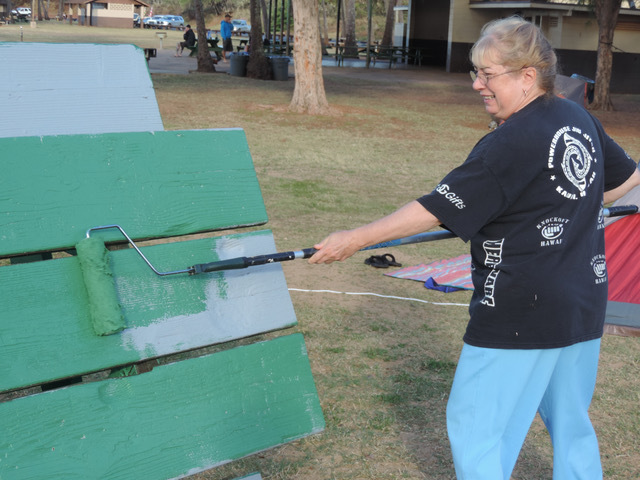 The Club this year had two different project days to paint pavilions and picnic tables at Salt Pond Beach. 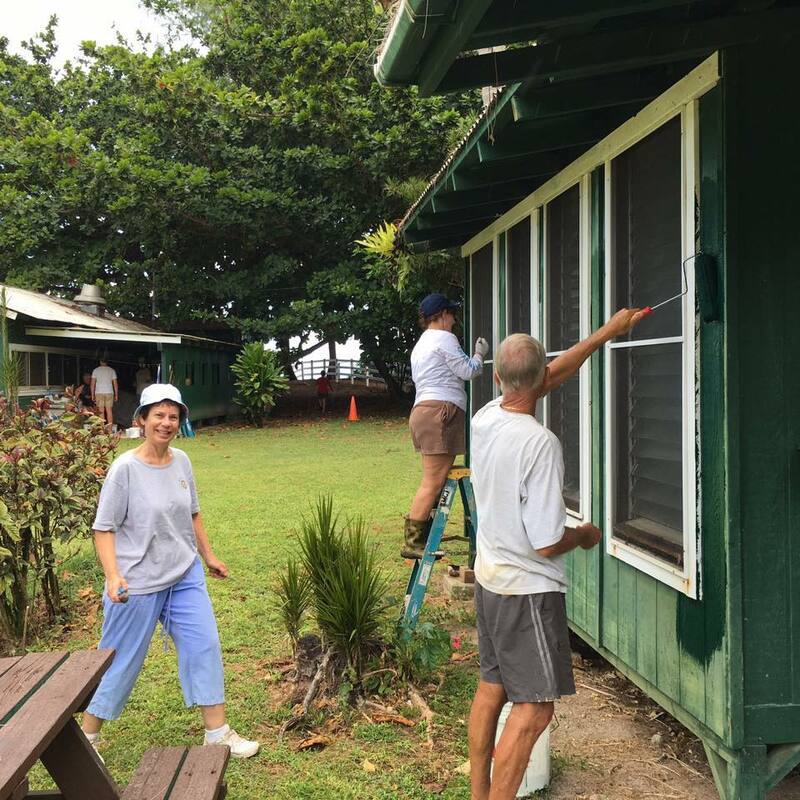 We were assisted one day by volunteers from Boys & Girls Clubs and on the other day by volunteers from Kauai Habitat for Humanity. 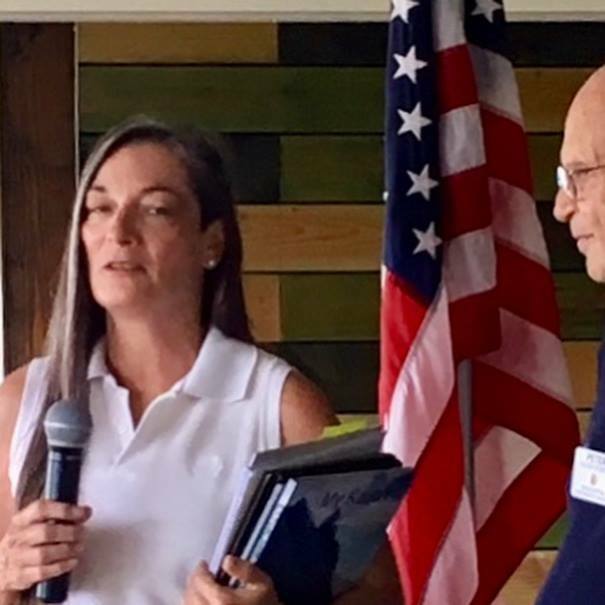 Upon completion of the two projects we were able to designate that the Weinberg Foundation then donate $10,000 to Boys and Girls Clubs and another $10,000 to Kauai Habitat for Humanity. 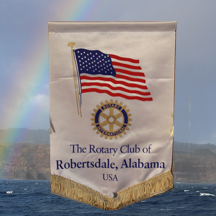 As Rotarians we believe part of our service is to the broader international community. As part of our international service Rotary Club of Poipu Beach helped to build a pre-school in Pursat Province, Cambodia. 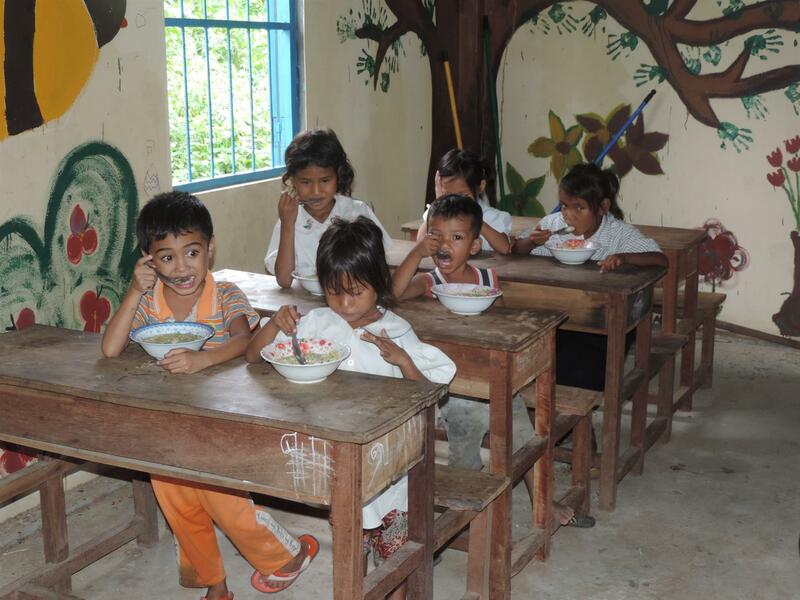 We provide ongoing support for the teacher, school supplies, and a meal program. Pictured above is International Service Director Dr. Craig Nishimoto visiting the school along with his wife, Annette. One of our key initiatives is supporting education and youth opportunities. 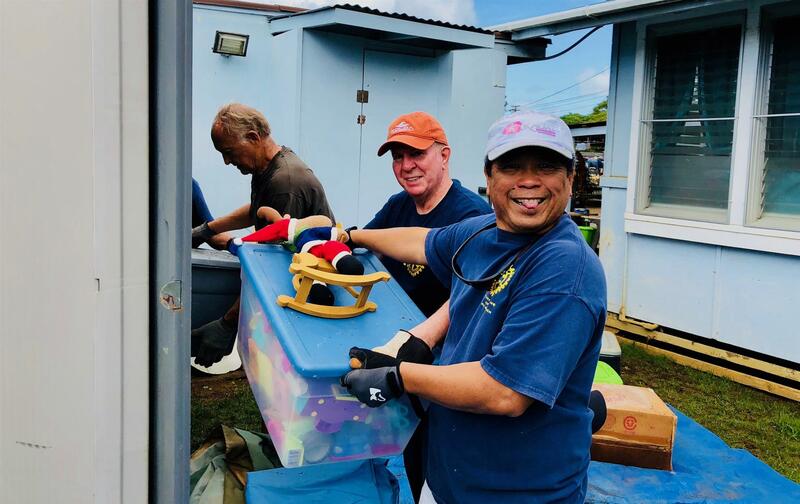 As part of that, we have partnered with Aloha Angels and Joe Nelson, owner of Koloa Surf Company, to sponsor supplies and field trips for 19 teachers at Koloa Elementary School. In addition, we are also sponsoring 8 after-school clubs. Here we are presenting a check from Rotary Club of Poipu Beach to Linda Uyehara, Principal of Koloa Elementary. Pictured are Chris Young, club President, Rick Cox of Aloha Angels, Linda Uyehara, and Michael Carlsson, past-President of our club. 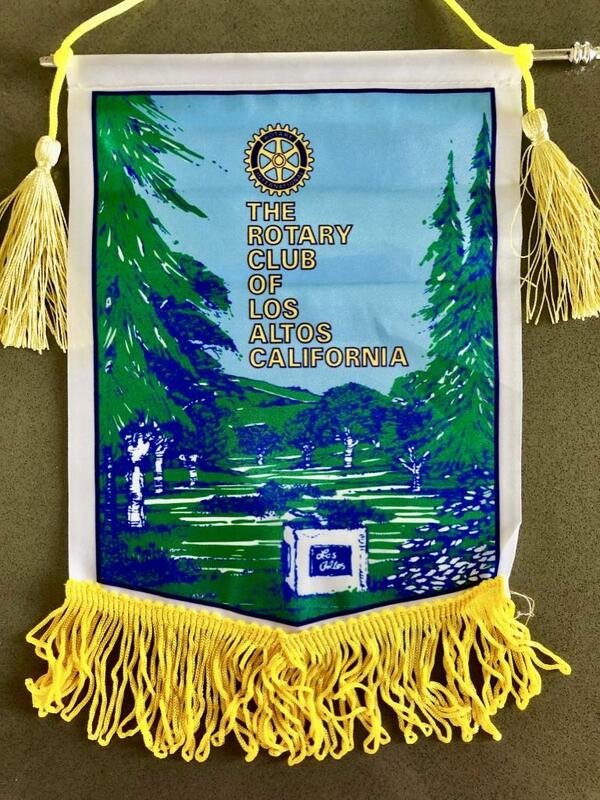 This is in addition to book donations, Rotary Readers, the Dictionary Project, and other work that Rotarians do with youth in the community. Excitement was in the air as Kalaheo Elementary School third graders each received their own dictionary from Rotary Club of Poipu Beach. Rotarians Bob Ray, Mary Kopitzke, and Marcie Millett shared with the students how the books can be used in lifelong learning. 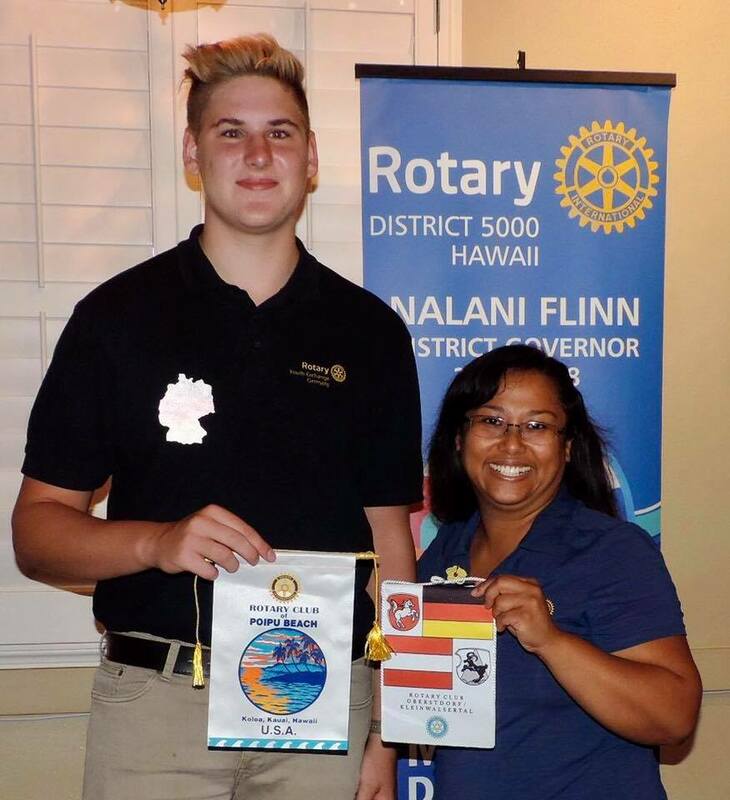 They were assisted by Germain Crocq, Rotary Exchange student from France, who is attending Kauai High School this year. Dictionaries were also presented to third graders at Koloa Elementary School, Kawakini School, and Island School. 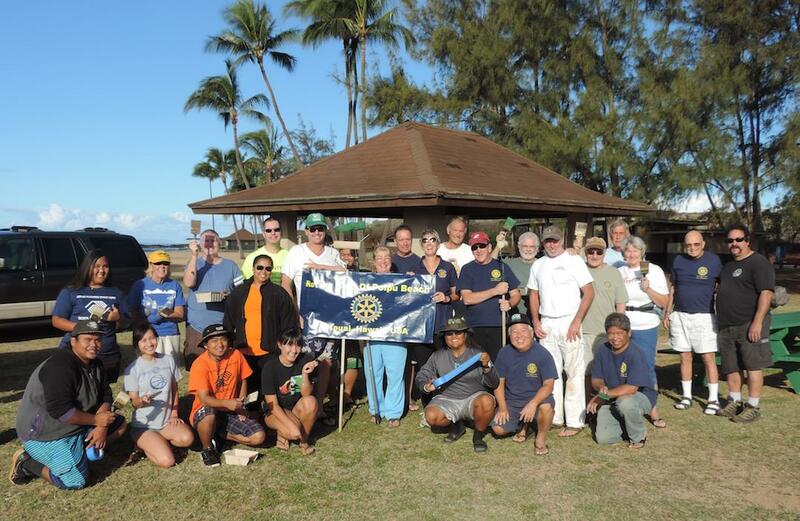 Rotary Clubs across Kauai installed and continue to maintain the yellow beach rescue tubes on our beaches. To date we know of over 140 people being rescued with these devices and there may be more. Please watch this video produced by the Kauai Lifeguard Association on how to use the tubes. It's wise to be prepared! 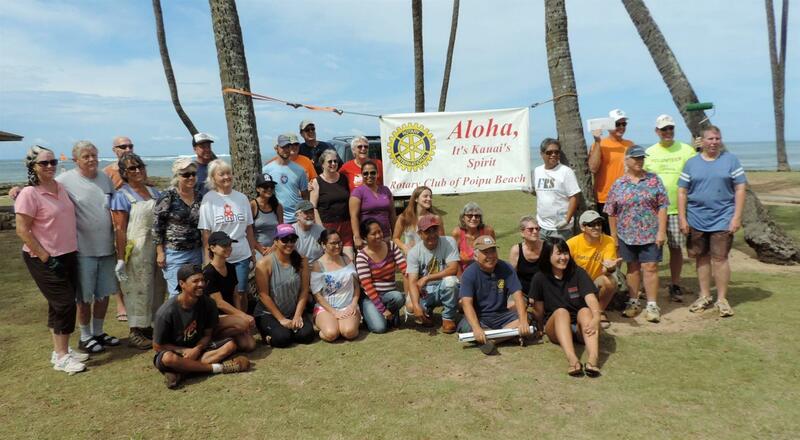 Rotary Club of Poipu Beach installed and continues to maintain all the beach rescue tubes on the South shore of the island.